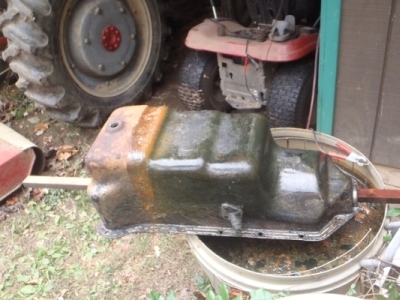 Working on old tractors means dealing with old parts, covered in grease, dirt, rust, and several layers of old paint. Most hardware stores will have an assortment of solvents, strippers, cleaners. and rust converters. Most of these products range from mildly to highly dangerous. None of them ever seem to work any better than plain old power washing, scraping, wire brushing, and sanding. Elbow grease is free and safer but slow when faced with a big job like a very neglected tractor. When faced with any project, one thing is nearly always certain, someone has been there, done that, and probably wrote all about the experience on the web. A few web sites described an inexpensive process that would remove rust, grime, and paint using nothing more hazardous than washing soda, and low-voltage DC from a battery charger. ELECTROLYSIS is the BEST way I have found to clean all sorts of parts. It works while I relax or do other things, and costs very little to operate. A 5-gallon bucket is a good size to start with for small parts. The setup is very simple. Fill your container with water (straight from the faucet is fine). Gradually stir in about 1/4 to 1/3 cup of Washing Soda for each 5-gallons of water. Place sacrificial steel electrodes around the edge of the container and tie them together with wire. Hang the part to be cleaned from a steel wire in the middle of the container. Make sure the part to be cleaned is immersed in the water, and does not touch the sacrificial metal at any point. IMPORTANT! Connect your positive lead to the sacrificial electrodes and the negative lead to the part you want to clean. Larger parts will require a larger container. This is a 25-gallon plastic trash can. The red and black clips are the leads from my ancient Sears Craftsman 2/10-amp automatic battery charger. Like much of the info on the web, most of the people using and writing about the process have no idea what is really happening in their tank. I don't have a degree in physics either, so I don't claim to know exactly what is happening. Based on my own observations, only the rust that is in immediate contact with good metal is being converted to a combination of iron oxide and magnetite. This appears as a black powder deposit on the clean metal. None of the rust is converted to new steel, most of the grease, dirt, paint, and rust is not converted into anything. Most of that stuff floats off with the gas bubbles and sinks to the bottom of the tank or floats on top for a while. The gas bubbles forming on good steel seem to help loosen and push paint and grime off the parts. The sacrificial metal very quickly becomes very rusty and literally is being sacrificed to clean the good parts. Do not use anything you might want to use later as your sacrificial metal. ELECTROLYTE: Electrolyte is the washing soda and water solution in your tank. You only need about 1/4 cup of washing soda for each 5-gallons of water. That is enough to get the current flowing. Adding more washing soda will make the solution more conductive and increase the amount of current flow, but does not appear to speed up the process and may burn out your charger. This is a case where more is not better, it simply wastes energy. Start with about 1/4 cup per 5 gallons and adjust to your conditions. You can fine-tune the mixture by watching your ammeter and stirring in a little more washing soda. When you see bubbles forming on the parts, the process is working. The electrolyte will last indefinitely, it just gets more and more dirt, grime, rust, and paint deposited as sediment at the bottom. If you don't stir it up, it can just lay there. A lid for the tank helps keep trash out and greatly slows evaporation. There is no need to add more washing soda when refilling water lost by evaporation. Only the water evaporates, the original washing soda stays in the tank. The solution strength indicated with washing soda is a bit caustic. It can be irritating if you have sensitive skin, or if you leave it on your skin long enough to get a reaction. Don't splash it in your eyes! I wear safety glasses as a rule in the work shop. It is a good habit to get into. Some people add lye or other ingredients. I don't believe the health risk is worth any benefit these products may have. 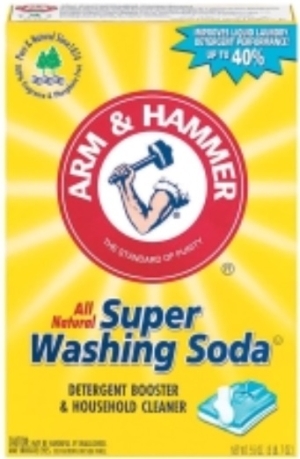 Arm-N-Hammer Super Washing Soda is usually sold as a laundry booster and can be found near the laundry detergents in some stores. It's really pure Sodium Carbonate also known as Soda Crystals or Soda Ash. If you can't find the Arm-N-Hammer super washing soda, look in swimming pool supply stores for a PH booster such as "ph-UP". Check the ingredients label. What you want is 100% Sodium Carbonate, NOT sodium Bicarbonate (baking soda), or sodium hydroxide (lye), or any other ingredients. POOL PRODUCTS: If you do find Sodium Carbonate in a swimming pool supply store, it may be PURE Sodium Carbonate. The Arm-N-Hammer Super Washing Soda may seem like a dry powder, but it actually contains about 15% water. The swimming pool stuff may be much more concentrated (dryer). Start with less of the Swimming Pool ph-UP product (1/4 cup for 10 gallons) or you may burn up your charger. Adding more is easy. If current seems too high, drain off some liquid and replace with clean water. If you cannot find washing soda Arm-N-Hammer Baking Soda will work. It is less effective, and there are other disadvantages. I used baking soda in my first 5-gallon test tank. It worked well enough to sell me on the process. If you have very sensitive skin, that would be a good reason to give up a little efficiency in favor of a milder electrolyte mixture. Even with washing soda, when mixed at the rate of 1/4 cup for 5 gallons of water, the electrolyte I've never noticed any irritation at all, even on the more sensitive fore arm and wrist area. BATTERY CHARGERS: My power supply is an old Sears Craftsman automatic battery charger. It has a switch to select 2 or 10-amp output and a dial ammeter. Use the 2 amp setting. More is not better. Any current flow starts the process. Using the 10-amp setting just wastes energy and makes more heat. If you have a 6 volt charger, you might have to add a little more washing soda to make your electrolyte more conductive. If you see bubbles forming, it's working. I would not use a 24 volt or higher voltage. More voltage just gets more dangerous, and anything over 50 volts DC can be lethal! Some automatic battery chargers do not work well for electrolysis. Do not use one of the little battery tenders. These small chargers cannot keep up with the current draw and you will just burn it up. Electrolysis requires CLEAN DC power. Any AC power that gets through the charger into your electrolysis tank slows down or can even stop the process. If your system does not seem to work well, try putting a 12-volt car battery in the circuit. All automotive battery chargers convert 120 volts Alternating Current (AC) to about 14 volts Direct Current (DC) for charging. Many newer electronic chargers do not produce clean DC or simply will not work if they are not connected to an actual battery. 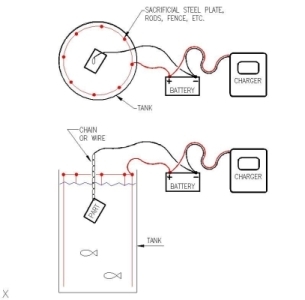 The drawing below shows how to connect using a battery. The "fish" swimming in the tank are to illustrate that the solution is relatively safe, not that the tank is a good habitat for any type of fish, GRIN. SACRIFICIAL STEEL: Any steel material can be used as sacrificial metal. "Sacrifice" does mean this material will be fairly thoroughly used up. Use scrap or something inexpensive such as steel rebar. Stainless steel sacrificial material will last much longer than plain steel. There are some warnings on the web that using stainless steel for the sacrificial anode may create hazardous waste. The warnings claim that, as stainless steel breaks down, it releases chromium and other toxic substances into the electrolyte, turning it into toxic waste. I doubt the accuracy of these warnings and suspect they are mostly exaggerations. In my ignorance, I continue to use plain steel for my sacrificial anode, mostly because I have an abundant supply of old welded wire fence fabric. Galvanized steel is probably something else that shouldn't be used for sacrificial steel. The galvanizing has almost completely weathered away from the old fence material I use. The fence fabric has a much larger surface area than a few pieces of rebar. That creates many more "sight" lines to the rusty parts and works great for me. CONTAMINATION: Substances like copper, zinc, alloy metals, and various chemicals may eventually contaminate your electrolyte. These can be deposited on the parts being cleaned. The tiny bit of electroplated foreign material seems to have no effect on my finished parts. Drain and replace the electrolyte if this becomes a problem. 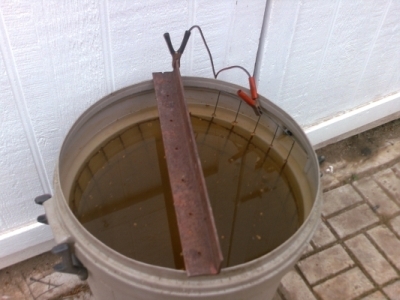 MONITORING: Electrolysis with washing soda requires very little monitoring. Iron and steel parts can be left to cook indefinitely with no damage. They may get a little warm, but the process only removes rust and loosens most paint. Once all the rust is removed, the parts just hang in the vat with a little current going through them. I have often left parts cooking overnight. Be careful with parts made with aluminum, brass, and other metals. Plated finishes could easily be ruined. I have not had any problems using my tank to remove paint from the few non-steel parts I have tried, but you could ruin some non-steel parts if you left them cooking unattended. LINE-OF-SIGHT: Electrolysis is a line-of-sight process. The sacrificial metal needs to be able to SEE the rust. The larger your tank and the more distance you put between the part and your sacrificial metal, the better your tank will be at cleaning odd-shaped parts. Paint and dirt can block the process from working on the rust. Most old paint will prove to be loose enough to allow the process to work under it and loosen the paint. I have found that it helps to occasionally pull the parts out for a moment and brush most of the loosened stuff off by hand. It can be a bit tricky to get all the rust out of cracks and crevices. I usually still need to do a little wire brushing and scraping before the parts are clean enough to re-finish them. It is possible to clean inside something (like a gas tank). The setup is just an inside-out version with the sacrificial metal inside the part to be cleaned. Attach an insulated wire to a piece of sacrificial metal (big rusty bolt) then wrap the sacrificial metal with a porous insulating material (PVC pipe drilled full of holes works good). Put the insulated sacrificial metal inside the part you want to clean. Attach the negative lead to the part, and the positive lead to the insulated wire coming from your sacrificial metal, then fill the tank with electrolyte, or sink the whole works into your tank if the part won't actually hold water. NEGATIVE LEAD: Hook the wires up backwards and your vintage part will become sacrificial! Please make sure your sacrificial metal is always connected to the positive (RED) terminal, and good parts are connected to the negative (BLACK) terminal! Any class in basic electricity will explain that current is the flow of positive or negative charges, and because the positive charges are stationary in the various types of metals used as conductors, the negative electrons are actually moving from negative to positive (the direction opposite of conventional current flow). This is a case where too much knowledge only serves to confuse. Just remember any items connected to the RED lead will become sacrificial, and will RUST! FINISHING: The rust attached to good metal is converted to an iron oxide and magnetite. This looks like a black powder on the parts. This residue should wipe off easily as soon as you pull the part out. The clean metal will immediately start rusting if you don't use something to prevent it. Let it dry on there and it will help keep the parts from rusting if you aren't going to finish them immediately. You can later put the part back in the tank for a while to loosen the black stuff, or just prime and paint over it. Most of my parts still need some wire brushing and/or light sanding before I feel like they are ready to be finished. Heavily rusted parts do not come out smooth. The rust is loosened from the good metal, most will fall off. After cleaning, the part will have pits and valleys where the rust was. Electrolysis will not fill those pits and valleys with new steel. For a smooth finish you may need to apply a skim coat of filler. EXPLOSIVE GAS: YES! This process does generate hydrogen gas. These gasses will burn or even explode if allowed to accumulate. Remember the Hindenburg. The local 6:PM news anchor may use the word "explosion" to describe the event as they show pictures of the fire truck spraying water on what is left of your shop. DO NOT leave your tank running indoors or with the tank covered. Provide good ventilation to prevent a build up of gasses that can become explosive. FREEZING My tank sits outside all winter and it usually does not freeze more than the top inch or two. Washing soda lowers the freezing point. If the temperature is significantly below freezing for several days, my tank will begin to freeze unless it is in-use. 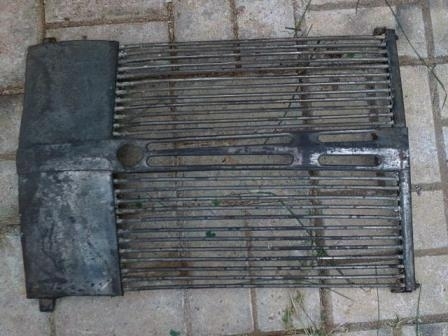 This is my tractor grille after an overnight dunking. You can see that it has a dark finish. This is the black iron oxide/magnetite coating that is left as the rust is converted. Layers of paint literally bubbled right off. It finished overnight while I slept! It would have taken many hours for me to strip and clean around all those bars by hand. This and an oil pan are the largest parts I have been able to do so far. This oil pan had to be done on one end, then turned over to do the opposite end. This is a good before - after photo, taken just before doing the second half. Large parts have a large surface area, so the current will be higher. Check the parts and charger a few times to make sure nothing is getting hot. The biggest problem with large pieces is keeping them from making contact with the sacrificial electrodes. Electrical current will always follow the path of least resistance. If the part touches your sacrificial metal, it shorts out. This could ruin your charger. Some people have provided physical protection to prevent the sacrificial metal from touching parts. One of the best ideas I have seen was to cut a piece of 3/4" PVC pipe for each piece of rebar. Drill a series of large holes in the pipe about 1" apart and put the piece of rebar inside. The rebar can still "see" your parts through the holes, but the PVC keeps them from touching. Return to V8-8N Project Page.